A Step by step guide to implementing the management systems of W. EDWARDS DEMING and ELIYAHU M. GOLDRATT. Dr. Deming and Dr. Goldratt are recognized as two of the foremost geniuses of modern management. The integration of the Theory of Constraints and the System of Profound Knowledge into one cohesive process brings the work of these two great thinkers to a new level of accessibility. The tools presented in this book will enable any organization to manage effectively, develop focused business strategies and create an atmosphere of continuous improvement. You will not find a quick fix in these pages, but with determination and focus you will be able to control and radically improve your organization. The authors have devoted their professional lives to understanding and implementing the processes presented in this book; Domenico Lepore as a Deming scholar and Oded Cohen as Eli Goldratt’s collaborator and partner. 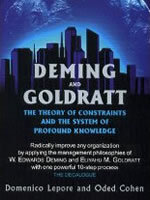 Dr.'s Deming and Goldratt are recognized as two of the foremost geniuses of modern management. The integration of the Theory of Constraints and the System of Profound Knowledge into one cohesive process brings the work of these two great thinkers to a new level of accessibility. The ten steps of the decalogue reflect the basic concept that in order to manage effectively we must be able to predict the outcome of our management decisions. This seemingly simple statement is the core of successful management. You will not find a quick fix in these pages, but with determination and focus you will be able to control and radically improve your organization.